I'm very excited to do some of the projects that I've seen. 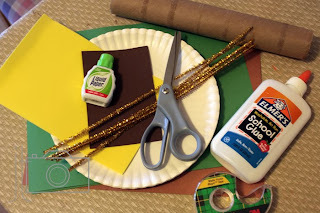 to make the party more festive. some other football related crafts. 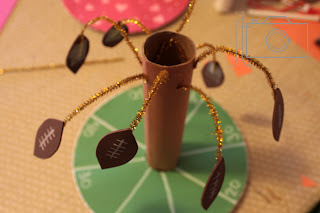 how I adapted this craft for Valentine's Day. This is the stash for the football centerpiece. 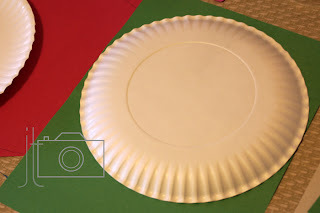 Trace your paper plate upside down onto green construction paper. 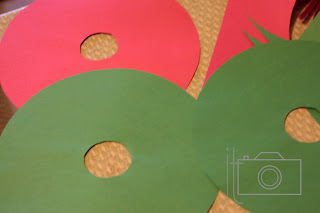 Cut out the circle you just drew and trace the paper towel tube in the center of that circle and cut that out as well. 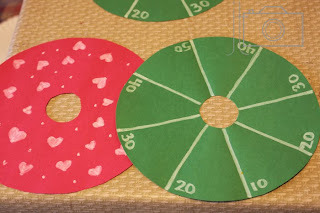 Decorate your circles with yard lines. 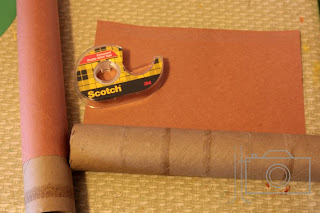 Cover the paper towel tubes with brown (football) construction paper. 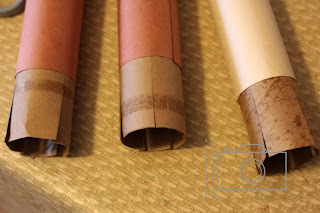 Some of the tube will not get covered if you use a standard sheet of paper and that's okay. 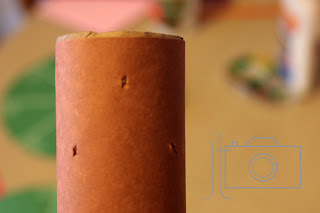 Cut about five slits in the bottom of the tube that's not covered all the way up to where the paper starts. Fold these slits out at the same point on each one in order to make the tube stand up. 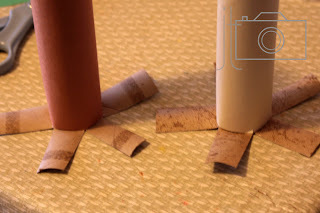 Put the end of the tube through the hole in the colored construction paper. 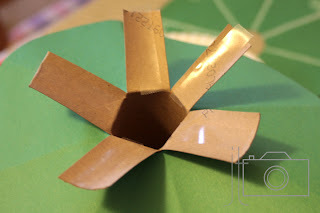 I put double sided tape on these little "legs"
Using the colored construction paper as a guide put the legs of the paper towel tube onto the paper plate and secure with tape. 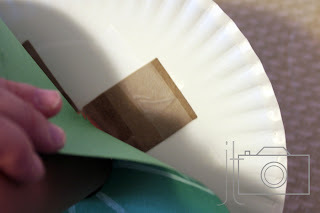 I also used some double sided tape on the 40 and 20 yard lines to secure the construction paper to the plate. 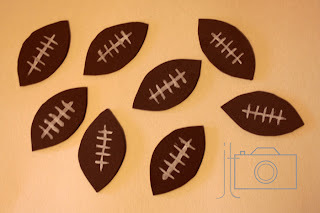 Cut out football shapes from the brown fun foam and draw stitch lines on with paint pen or white out. 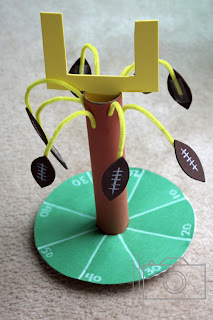 Tape the football or heart shapes to pipe cleaners that have been cut in half. 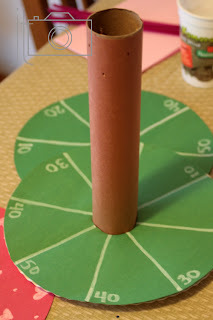 Add pipe cleaners to the already poked holes in the top of the paper towel tube. 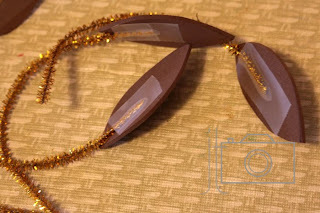 I suggest bending the pipe cleaner up so that it is more secure. was the same size as the paper towel roll so I could just slip it in. And then stand back and admire your work! Place it on the table with all the great (yummy but not good for you) appetizers. I'd love to see your take on this project. Make sure to link back here with your version! 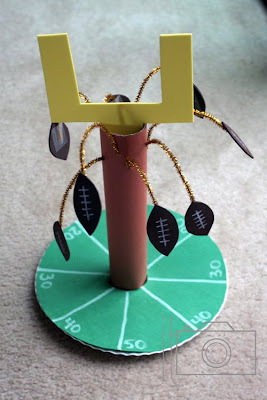 Love this for the Super Bowl this year, thanks!